We were blessed with some unbelievably warm weather over the weekend and I was able to take this little number out for a spin. This silk dress from Adela Mei is simple, sleek, and most importantly fits (and flows) in all the right places! As someone who is 5'2", finding pieces with the right length can be tricky. Jeans are rolled a few times, pants are often altered, and midi dresses usually fit me like maxi dresses. You get the idea... Luckily, a boutique like Adela Mei exists! It curates pieces from brands such as Cameo, Keepsake, Line & Dot and many more especially for the petite. It sure is nice to have someone do the searching for me! Heidi silk dress by Myne c/o Adela Mei. Striped fur clutch from ASOS. Obsidian croc petite power cuff c/o Isharya. Cut out layered crystal ring c/o Sole Society. 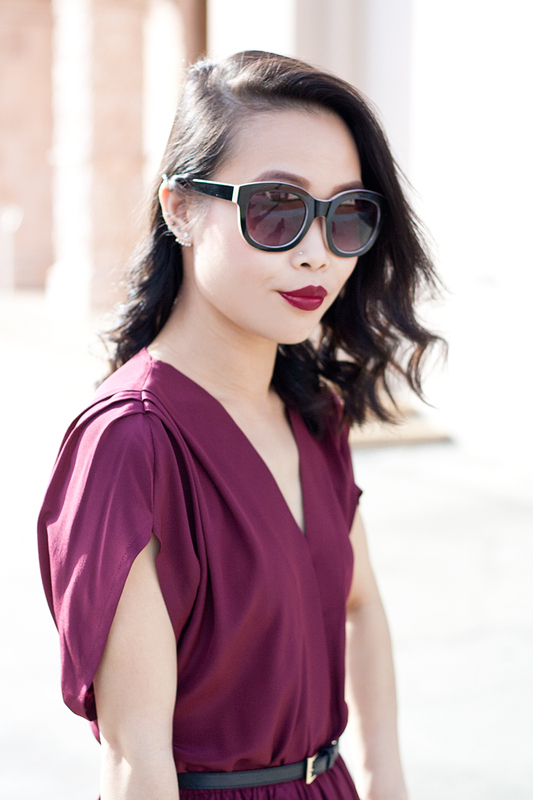 Two tone sunglasses from F21. Wow! Gorgeous dress & bag combo. Can't believe the bag is from Asos! Gorgeous color on that dress!